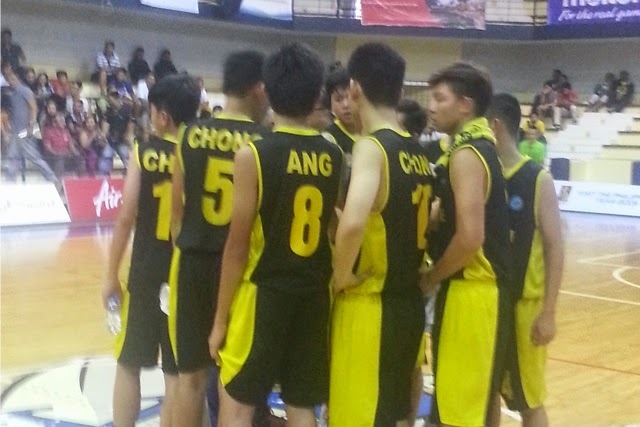 The 2015 SEABA U16 Championship kicked off yesterday and continued to heat up today, with the hometown favorite Batang Gilas and Indonesia rising to the top of the table with separate wins. Malaysia and Thailand, meanwhile, are tied at 1-1, while lowly Brunei dwells in the cellar with two straight defeats. Coach Mike Oliver (L) successfully steered Batang Gilas to a win over Malaysia on Day 2. - The Indons started their campaign with aplomb, devouring the Bruneians from the get-go to win by an eye-popping margin. All but one Indon player finished in double-digit scoring, with Kenneth Kay Liwa’s 23 points and 8 rebounds leading the way. Agassi Goantara, Miguel Fernanda, Juan Felix Ericsson, Nicholas Anelka, and Ahmad Sulthan Yassar each recorded at least 15 points for the victors. Nobody on Brunei’s roster scored more than 6 markers. Brunei was just outclassed, and that's an understatement. - Malaysia saved its best for last, outscoring Thailand, 27-12, in the fourth period to go on and notch its first win of the tournament. 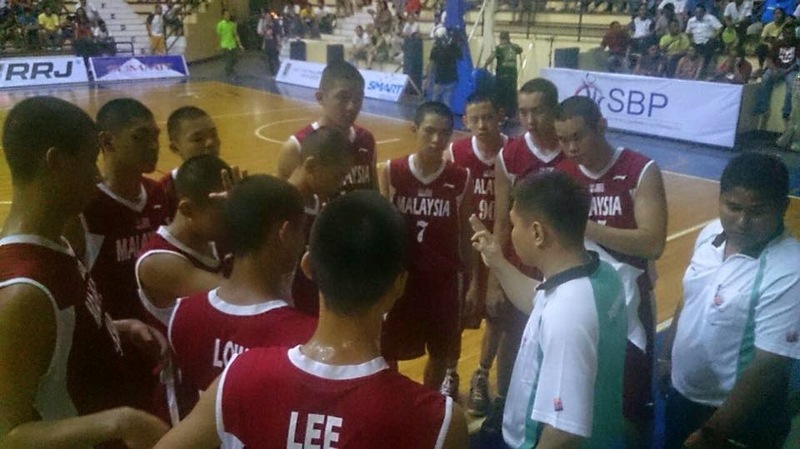 The Malaysians lost the rebounding battle, 50-57, but they made up for it by forcing 49 Thai turnovers. Zhong Shin Thea paced the winners with 15 points and 6 rebounds, while Kalven Lim and Lewis Inpik scored 12 and 11 markers respectively. On the other end Suphakit Thitikhunrat paced Thailand with 18 points and 15 rebounds, but he turned the ball over 11 times. Team Malaysia opened its account with a good win over Thailand. 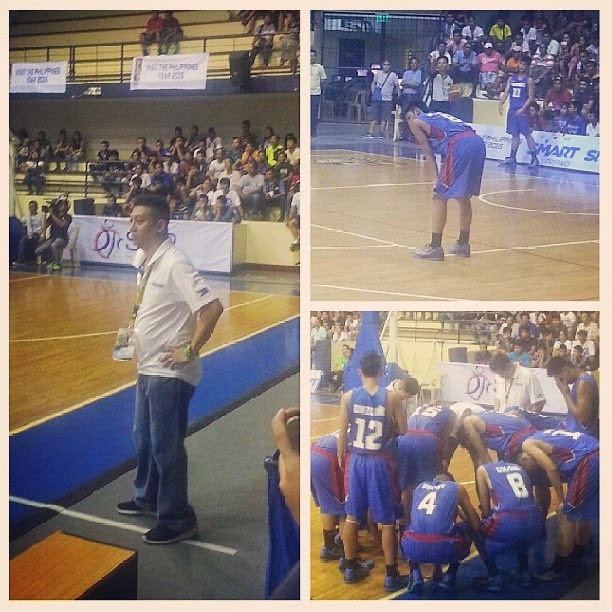 Coach Dany Yong gives some instructions to his wards. - Thailand rebounded from its defeat to Malaysia by running roughshod over Brunei. The Thais put the pedal to the metal after the tip and never looked back to gain their first triump in the competition. 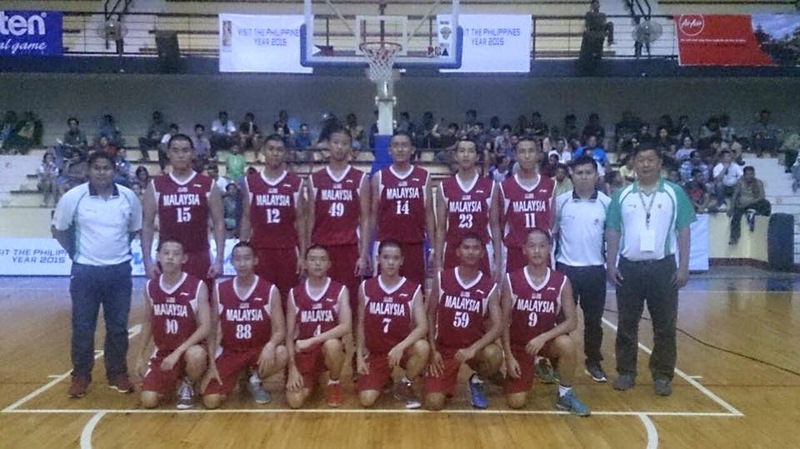 They overwhelmed Brunei with 90 points in the paint and also forced their victims to commit 61 turnovers. Suraphop Jamgrajang led Thailand with 18 points and 8 rebounds in only 18 minutes, while Apisit Phumphrao added 15 points and 4 steals. Wee Liang Soh paced the Bruneians with just 9 markers. - Malaysia kept in-step with the hosts in the first ten minutes of play, but Batang Gilas upped the pressure and proceeded to blow the game open in the second quarter. With Will Gozum ruling the interior and Gian Mamuyac anchoring the defense, coach Mike Oliver’s wards coasted to their debut win. Jonas Tibayan eventually wound up leading the victors with a 22-point, 11-rebound double-double, while UPIS standout Juan Gomez de Liano came off the bench to score 20 points and grab 9 boards in just 17 minutes. Mamuyac ended up with 17 markers and 6 steals, while Gozum added 9 points, 8 boards, and 3 blocks. 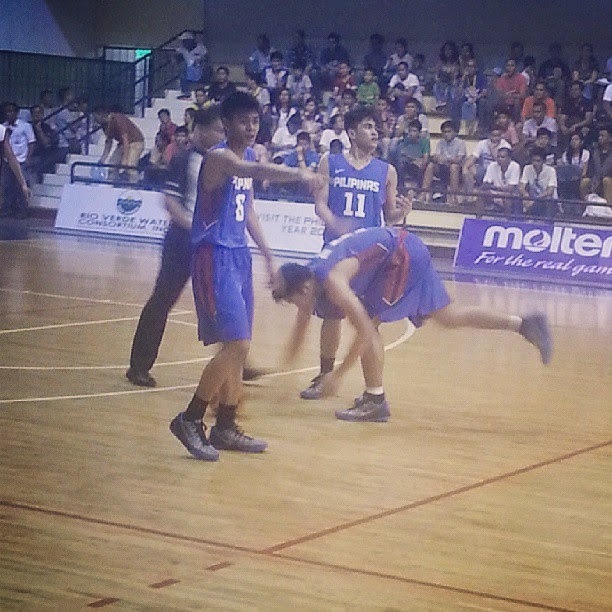 Rising star SJ Belangel also impressed with 10 points, 10 assists, and 6 rebounds. Kalven Lim and Ken Yen Low paced Malaysia with 26 and 11 points respectively. 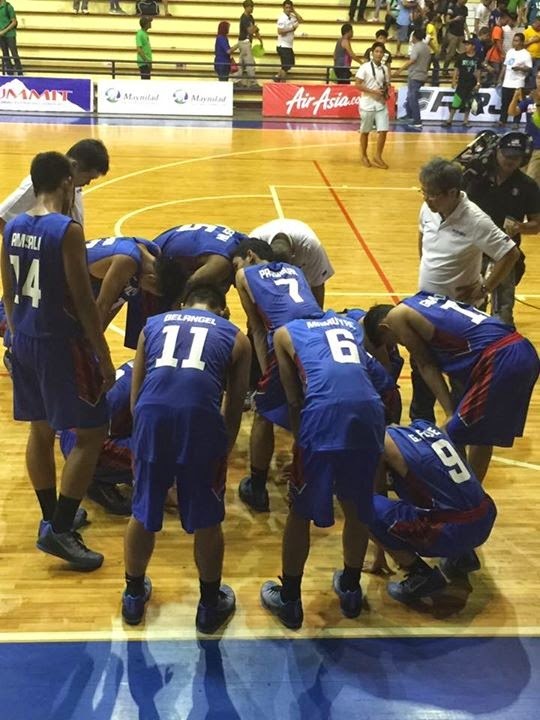 Batang Gilas huddles after their first win. Gian Mamuyac provided great energy on defense. 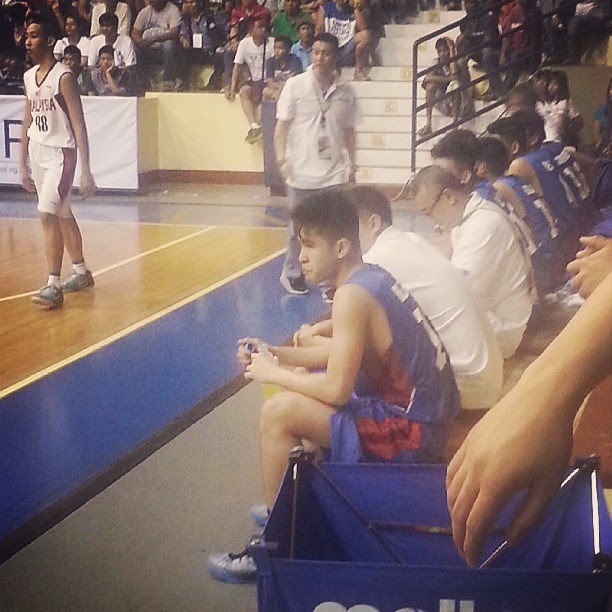 SJ Belangel was awesome as a scorer and playmaker.